Today, people, businesses, government officials, and law makers are unaware of the business model that supports their favorite technology such as smartphones and connected products that are supported by the Android, Apple, and Microsoft Windows operating systems. The connected-product business model comprises surveillance and data mining business practices rooted in “surveillance capitalism.” These are terms that the public is unaware of because all parties concerned are not transparent about their business practices. Companies that have adopted a surveillance capitalism business model are in the business to exploit their paying customers or product users for financial gain at the expense of the user’s civil liberties, privacy, cybersecurity, and safety, whether the product user is an adult or a child. Don’t take my word for this claim: Former Alphabet Inc. executive chairman Eric Schmidt, Facebook co-founder Sean Parker, and former Google designer Tristan Harris admit that Google and Facebook develop addictive, intrusive, and even potentially harmful technology in order to exploit the product user for financial gain. “I actually think most people don’t want Google to answer their questions. … They want Google to tell them what they should be doing next,” Schmidt told The Wall Street Journal in 2010. “We don’t need you to type at all. We know where you are. We know where you’ve been. We can more or less guess what you’re thinking about. Now, is that over the line?” he said in an interview with The Atlantic at the Washington Ideas Forum in 2010. Parker said in an interview with Axios in November 2017: “It’s a social-validation feedback loop; it’s exactly the kind of thing that a hacker like myself would come up with, because you’re exploiting a vulnerability in human psychology. The inventors, creators—it’s me, it’s Mark [Zuckerberg], it’s Kevin Systrom on Instagram, it’s all of these people—understood this consciously. And we did it anyway. What is frightening is that Parker indicates that companies such as Facebook are not concerned that they may be harming their product users and customers, whether the product user is an adult, business professional, or child. The Federal Trade Commission, lawmakers, individuals, parents, and businesses that use Facebook should be highly concerned over Parker’s admission that Facebook is designed to be addictive in order to exploit the user for financial gain at the expense of the user’s privacy, cybersecurity, and safety. “The average person checks their phone 150 times a day. Why do we do this? Are we making 150 conscious choices? One major reason why is the number one psychological ingredient in slot machines: intermittent variable rewards. … Addictiveness is maximized when the rate of reward is most variable. 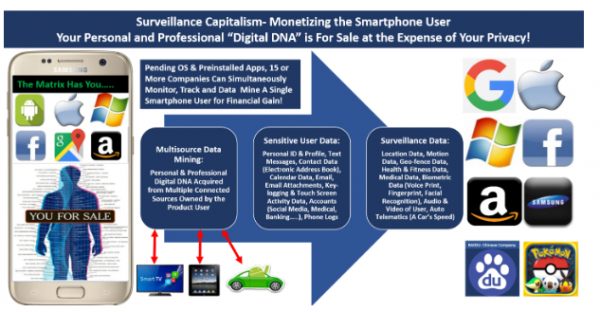 Surveillance capitalism simply means that social media, smartphone, and connected-product users have been monetized by data-driven technology providers, which include social media providers, telecom providers, device manufacturers, operating system developers, and content (apps, widgets, etc.) developers. I want to be clear that companies such as Google, Apple, Microsoft, Amazon, and Facebook do not sell their product users’ personal information directly to any third-party. However, these companies sell access to their users via intrusive and exploitative pre-installed (“rooted”) content such as apps, widgets, and emojis. Additionally, third-parties can gain access to the connected-product user via intrusive and exploitative third-party content that is distributed through sources such as Google Play and the Apple App Store. People need to understand that pre-installed and third-party content such as apps are primarily designed to enable the content developer with the ability to monitor, track, and data mine the user for financial gain 24 hours a day, 7 days a week, 365 days a year. As Parker said, it’s the kind of thing a hacker would come up with. To the user, apps provide convenience, entertainment, and information. However, to the app developer, the app is the vehicle that is used to collect, use, share, sell, and aggregate the product user’s information for financial gain. A person’s collective digital DNA is the most valuable commodity in the digital age. The product user produces personal and professional digital DNA by simply using a connected product such as a smartphone, tablet PC, TV, vehicle, and popular voice-automated products such as the Amazon Echo powered by Alexa. Connected-product users can be described as “uncompensated information producers” who are being exploited for financial gain at the expense of the user’s civil liberties, privacy, cybersecurity, and safety by the very tech companies that the user patronizes with their trust, loyalty, and hard-earned money. The user pays for a product such as a smartphone and produces digital DNA that is then exploited for profits by the service providers, who do not compensate the product user for producing the valuable digital DNA. This would be like buying your own tools to dig up diamonds only for the diamond mine operators to sell the diamonds for cash without compensating the diamond miner, even though the diamond miner had paid for the tools. To lose privacy is bad enough but to be exploited for profits at the expense of your civil liberties, privacy, cybersecurity, and safety is unacceptable. Corporate surveillance rooted in surveillance capitalism poses a greater threat to civil liberties, privacy, cybersecurity, and safety than National Security Agency surveillance programs such as PRISM (exposed by Edward Snowden) because the product user has been monetized by for-profit companies. Frankly, we do not know how our digital DNA is being used by data-driven technology providers such as Google, Apple, and Microsoft. Silicon Valley tech giants want us to be transparent with our personal and professional lives, yet these tech giants do not want to be transparent about their surveillance and data-mining business practices. We’re not sure if our personal and professional digital DNA is being used in a harmful manner, which was the case for Facebook users in the Cambridge Analytica scandal. The Cambridge Analytica scandal should be a wake-up call to all connected-product users, because the exploitation threats associated with the scandal are also systemic in all connected products that are supported by the Android OS, Apple iOS, and MS Windows OS. At the end of the day we are not sure if Google, Apple, Microsoft, Facebook, Amazon, and other tech giants are in fact using, sharing, selling, purchasing, and aggregating our collective digital DNA in a harmful manner. For example, is our digital DNA ending up in the hands of data brokers (e.g., Cambridge Analytica), state actors (foreign/domestic), law enforcement, business competitors, employers (current/future), insurance and bank underwriters, institutions of higher learning, or any other entity that could bring harm to the product user? Future articles will pursue the answer to this important question plus many others. In closing, let’s not forget that the connected-product user is the “paying customer,” and all companies concerned are required by law to be transparent in regards to surveillance and data-mining business practices to the paying customer. After all, who wants to pay for intrusive, exploitative, and harmful products such as smartphones, tablet PCs, TVs, vehicles, or any other connected product that could bring harm to the product user, including children? It is time that the public data mines the data miners by demanding transparency regarding surveillance and data mining business practices employed by all parties concerned. Contact your service providers today and demand transparency! Rex M. Lee is a privacy and data security consultant and Blackops Partners researcher.